need a solar system type visualization for this, so we can really appreciate the change of scale. @preinheimer Asia & Australasia have it bad. 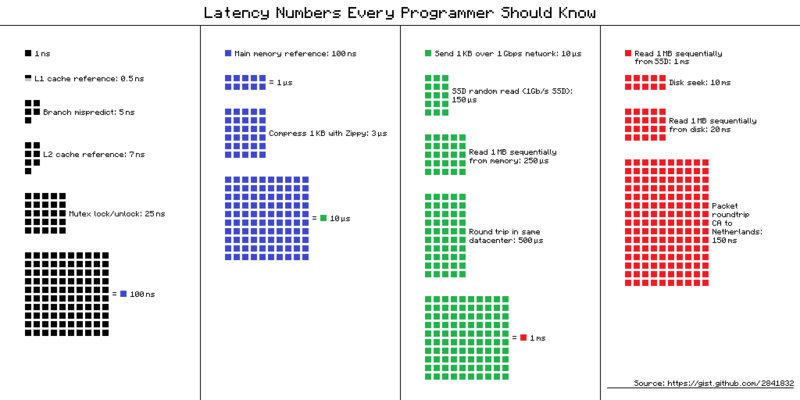 "Latency numbers every programmer should know" - yet naturally, it has no information about humans! This remind me of this Grace Hopper's video about Nanoseconds. Really worthy. I'm surprised that mechanical disk reads are only 80x the speed of main memory reads. Does L1 and L2 cache latency depends on processor type? and what about L3 cache. Ofc it does ... those are averages I think. Would be nice to right-align the numbers so people can more easily compare orders of magnitude. Also, regarding packet sends, that must be latency from send initiation to send completion -- I assume. If you're going to list mutex lock/unlock, how about memory barriers? Thanks! This is quite useful, particularly for flogging at others. Quick pie chart of data with scales in time (1 sec -> 9.5 years) for fun. "Read 1 MB sequentially from disk - 20,000,000 ns". Is this with or without disk seek time? Thanks everyone for all the great improvements. Here is a chart version. It's a bit hard to read, but I hope it conveys the perspective. How long does it take before this shows up in XKCD? If it does show up on xkcd it will be next to a gigantic "How much time it takes for a human to react to any results", hopefully with the intent to show people that any USE of this knowledge should be tempered with an understanding of what it will be used for--possibly showing how getting a bit from the cache is pretty much identical to getting a bit from china when it comes to a single fetch of information to show a human being. @BillKress yes, this is specifically for Programmers, to make sure they have an understanding about the bottlenecks involved in programming. If you know these numbers, you know that you need to cut down on disk access before cutting down on in-memory shuffling. If you don't properly follow these numbers and what they stand for, you will make programs that don't scale well. That is why they are important on their own and (in this context) should not be dwarfed by human reaction times. @BillKress If we were only concerned with showing information to a single human being at a time we could just as well shut down our development machines and go out into the sun and play. This is about scalability. this is getting out of hand, how do i unsubscribe from this gist? Does anybody know how to stop receiving notifications from a gist's activity? I'm also missing something like "Send 1MB bytes over 1 Gbps network (within datacenter over TCP)". Or does that vary so much that it would be impossible to specify? I'm missing things like sending 1K via Unix pipe/ socket / tcp to another process. Has anybody numbers about that? L1D hit on a modern Intel CPU (Nehalem+) is at least 4 cycles. For a typical server/desktop at 2.5Ghz it is at least 1.6ns. Fastest L2 hit latency is 11 cycles(Sandy Bridge+) which is 2.75x not 14x. May be the numbers by Norwig were true at some time, but at least caches latency numbers are pretty constant since Nehalem which was 6 years ago. Please note that Peter Norvig first published this expanded version (at that location - http://norvig.com/21-days.html#answers) ~JUL2010 (see wayback machine). Also, note that it was "Approximate timing for various operations on a typical PC". @jboner, I would like to cite some numbers in a formal publication. Who is the author? Jeff Dean? Which url should I cite? Thanks. I'd like to see the number for "Append 1 MB to file on disk". The "Send 1K bytes over 1 Gbps network" doesn't feel right, if you were comparing the 1MB sequential read of memory, SSD, Disk, the Gbps network for 1MB would be faster than disk (x1024), that doesn't feel right. Zippy is nowadays called snappy. Might be worth updating. Tx for the gist. Several of the recent comments are spam. The links lead to sites in India which have absolutely nothing to do with latency. Are there any numbers about latency between NUMA nodes? Sequential SSD speed is actually more like 500 MB/s, not 1000 MB/s for SATA drives (http://www.tomshardware.com/reviews/ssd-recommendation-benchmark,3269.html). Question~ do these numbers not vary from one set of hardware to the next? How can these be accurate for all different types of RAM, CPU, motherboard, hard drive, etc? Mentioned gist : https://gist.github.com/2843375 is private or was removed. It would be nice to be able to compare this to computation times -- How long to do an add, xor, multiply, or branch operation? Oh, and @mpron - nice! Note: I created my own "fork" of this. Heh, imagine this transposed into human distances. 1ns = 1 step, or 2 feet. Datacentre roundtrip = 94 mile hike. Internet roundtrip (California to Netherlands) = Walk around the entire earth. Wait! You're not done. Then walk from London, to Havana. Oh, and then to Jacksonville, Florida. Then you're done. Ram has gotten slightly faster. It is 70 ns now. there is an updated version of the latency table? This prezi presentation is reversed: the larger numbers are inside the smaller ones, instead of the logical opposite. Where is the xkcd version? Is there any resources when one can test himself with a tasks involving these numbers? E.g. calculate how much time will it take to read 5Mb from DB in another datacenter and get it back? That would be a great test of applying those numbers in some real use cases. I think given increased use of GPUs / TPUs it might be interesting numbers to add here now. Like: 1MB over PCIexpress to GPU memory, Computing 100 prime numbers per core of CPU compared to CPU, reading 1 MB from GPU memory to GPU etc. Some data of the Berkeley interactive version (https://people.eecs.berkeley.edu/~rcs/research/interactive_latency.html ) is estimated, eg: 4 µs in 2019 to read 1 MB sequentially from memory; it seems too fast. how about the time to complete a DNS request - UDP packet request and response with a DNS server having, say, 1ms response time, with the DNS server being 5ms packet time-of-flight away? Now, I wonder about malloc latency, can you tell about it? It is definitely missing because I can compute data without any lock as owning the data.